On April 21, 2018, ENGEO received a CalGeo Outstanding Project Award for our geotechnical evaluation of the Blu Harbor project in Redwood City, California. Janet Kan received the award on behalf of ENGEO and presented to the audience the dynamic geologic challenges of the site and our collaborative efforts with the client and contractors. 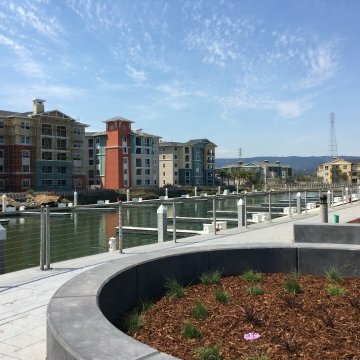 Urban development in Northern California is fueling innovations in geotechnical engineering as more complex sites are developed. Moreover, intense job growth around the Bay Area puts increased demand on high-density housing in urban developed areas. The Blu Harbor residential development is located in Redwood City, a seismically active region in California. Once a former marshland with a major slough until the late 1950s, the site was reclaimed by placing imported fill over the native compressible clay deposits, locally known as Bay Mud. The project site was formerly used as a private marina with approximately 50 boat slips. The 12½-acre site is surrounded by water on three sides, with an inner marina at the center of the site. ENGEO utilized a deep soil mixing technology brought from Japan to the US and designed a waterfront stabilization system for a high-density waterfront development project. Waterfront stabilization is deemed necessary to protect proposed structures and improvements from seismically induced lateral deformation. The project site was planned to be raised by 5 feet to combat potential sea-level rise in the next 50 years. DSM spoils generated were used as engineered fill to raise site grades, which lowered total construction costs by reducing the amount of expensive import soil. The DSM edge containment system consisted of interlocking DSM columns and panels that acted as a below-grade gravity wall to resist potential seismic lateral forces. This allowed shallow foundations with higher bearing capacity to be used near the waterfront, reducing foundation construction costs. The DSM edge containment system reduced the potential lateral deformations to tolerable amounts for the structures and improvements planned within the project site.